The subject of war is a very touchy subject, especially in 1967. The Vietnam war was in full swing. While this story wasn’t a direct result of that conflict, the end result of what took place on Eminiar VII certainly could be construed as a commentary about the war that was going on. Think about this: any conflict is still a conflict, no matter if someone is actually shot or not. People still die, especially in a disintegration machine. That’s the point that Kirk hammers home, and it’s a very good one. War is hell in every sense of the word. In the case of these two planets, they’ve been at war for hundreds of years. The conflict was handed down from generation to generation. But why? Why does an entire culture just blindly keep going on with the same thing that continues to cause death? That would be an interesting philosophical debate. I can only imagine that the terror of doing anything different is what kept the Eminians and their terrestrial neighbors on Vendikar locked into the conflict. Eventually, our heroes convince the two sides to negotiate and resolve their differences. When I first saw this episode, that ending is the one I was hoping for. I have a good feeling that it was what everyone viewing the show for the first time would have hoped for as well. 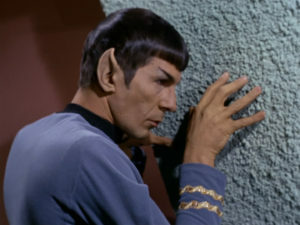 If there is one cool thing I always liked in this episode, it’s the scene where Spock uses his mind probing techniques to get one of the guards to open the door to the room in which they are being held. All in all, a great episode all around with themes that are just as prevalent today as they were 50 years ago. Next week, an episode that was almost called “The Way of the Spores”!